Over the years I have had the opportunity to share my experiences with other people. Some had called it “experience, strength and hope”. Nice. Well, I’m not too sure about all that, but I do know that I have had many and varied experiences … and learned some things in my time here on earth. The strength part is debatable. But the hope part brings me to today’s blog entry. 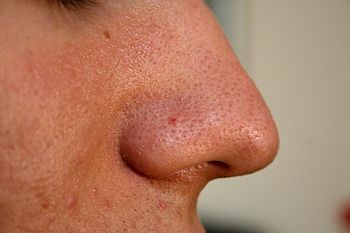 For whatever reason, today I’d like to share with you my Two Nose Theory. I am sure there are other variations on the theme which tell the same bottom line, but here is my story. A long time ago … twenty years or more ago … I was encouraged to become friends with two women. I had, maybe five years previous to that, done some basic reworking of my life and my views and my actions and was better off because of it. I was no longer married. The job I had held for years was non-existent. Everything I had ever used to identify myself by changed. I was a stronger woman and made better choices. And I was as tolerant as anyone you might ever meet in life. But try as I would, I could not bring myself to do more than tolerate them. Those two women. They were pushy. They were loud. They were controlling. They constantly said things to hurt my feelings. They were so full of themselves that it was all but unbearable being around them. Until through a series of events I became friends with one of them. The events are not as important as the fact that as I got to know this woman I discovered that she and I had much in common. Not in some of the typical ways but in some basic deep down ways. And it started me questioning decisions I had made in the past about people. Those things that had offended me or hurt me in the past. Things that had made me avoid some people. Really looking at my part in it all. And for the first time I saw a pattern. The pattern had to do with the fact that I, much as I hated to admit it, also had my moments of pushiness, loudness, controlling and unintentionally hurtful and obnoxious behavior. Then I thought back to the various times that they and others had “done or said something” that caused me to become hurt of angry. And there was another pattern. When someone said “Oh you are stupid” or “Hey, you are a bad driver” or “You are short” … or anything else that I knew in my heart was incorrect … it did not affect me in the slightest. And my feelings were unaffected. But let someone say “You are a bit overweight aren’t you?” or “Man, you are being pushy.” or “You really didn’t do” something I had agreed to do … or anything else that I knew in my heart had even a grain of truth … it affected me greatly. I might have become defensive, or hurt, or angry. Or maybe I might have not been able to be a friend. The bottom line in all of this is My Two Nose Theory. If you or anyone else said to me “WOW you really have two noses there, don’t you?” it does not affect me. Because I know, deep down, that I only have one nose. And no amount of someone saying otherwise made me feel any differently. BUT if you said something that was close to the truth … and it is very unflattering to me … then I reacted emotionally. If there is something or someone or some words that cause me to react emotionally … or to be hurt … there is an odds on chance that there is something that I have to look at. Some behavior or actions that I need to change in myself. And when I do that, it is one less thing that can cause me pain in the future.